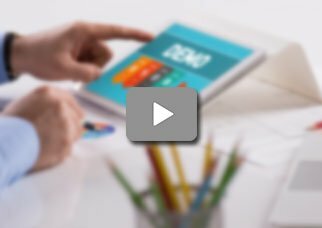 Compulink Dermatology Advantage is a cloud-based Dermatology-Specific EHR software designed by one of the leading software companies in the US with more than thirty years of experience in the industry. Compulink Dermatology Advantage is a complete all-in-one solution package that can manage an entire practice and includes Electronic Health Record (EHR), Practice Management (PM), Electronic Billing, e-Prescribing, Pathology Management, and Inventory Management. Compulink Dermatology Advantage is ONC-ATCB and CCHIT certified that can be used with all sized practices. 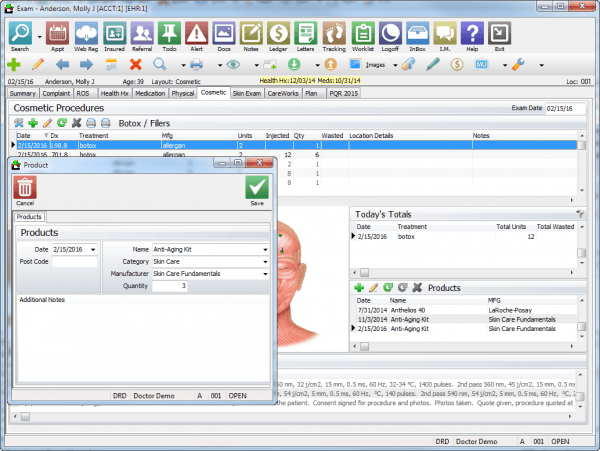 Dermatology-specific EHR software has built-in templates, image capture management, and charting tools for medical, Cosmetic and Mohs surgery. 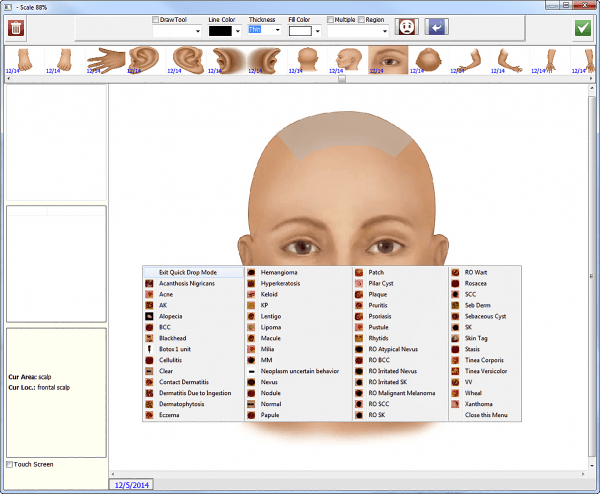 The software also has an integration with pharmacies, labs, diagnostic devices. 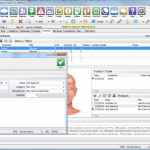 For faster billing, the software is embedded with dermatology-specific CPT and ICD-10 codes. 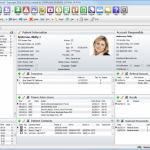 Compulink is available as a standalone EHR as well as a combined package with Practice Management and Medical Billing. 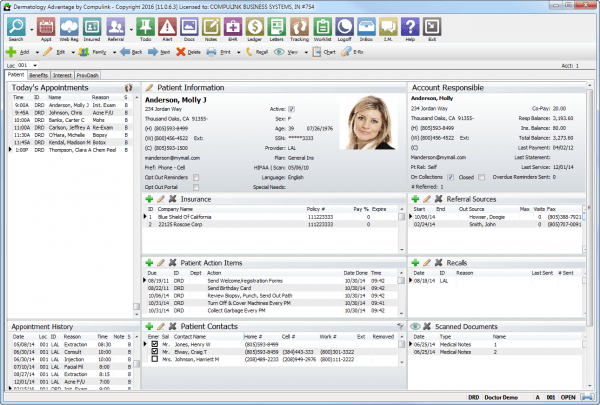 Compulink EHR makes documentation much easier through OneTab layout feature where entire exam can be documented on one screen and Unique Visual Documentation Engine which automatically generates exam documentation and orders using diagnosis information enabling you to document faster. Adaptive Learning Technology helps the EHR software in learning charting patterns of the practice and becomes adaptable accordingly. The software further optimizes operations through easy to use Patient Portal, Patient Scheduling, Fee-Based Scheduling, and Appointment Reminders. The integrated billing module includes features like Inventory Control, Eligibility Enquiries, EDI Support, and Credit Card Processing. The pricing for Compulink Dermatology Advantage is customizable according to specific needs of the practice. 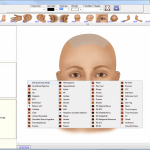 Pros: Compulink is the easiest software to train someone or to use in any practice. Cons: Sometimes the changes seem too fast and too much to keep up with just to stay current Short wait times. Verdict: This is difficult but lots of decisions and bay for good EHR options to set up. Ramon, Dermatology and Cosmetic Surgery. Pros: Dermatology-Specific EHR software designed to participate&comma; in problem-solving and utilizes the skills and improve productivity. Cons: They didn't respond to our email about access which is how they are to grant you access. Verdict: patient eligibility inquiries and payment issues should not be limited to clearinghouses.